I watched this fan on eBay for a while before deciding to make an offer. It was in Buenos Aires Argentina. The seller accepted my offer and was very quick in having it shipped. I completed the auction last Wednesday and it was here at the shop on Monday. The packing was really well done and no damage was incurred. The reason for my interest was the oddball cycles. Fan runs nicely on 110v 50 cycles. It is on display in the AFC Museum. Very nice fan. I was watching that one also. He has a Diehl for sale as well but I think it is way over priced and he will not come down on it. Glad you got it in one piece. That's a very nice original! Michael Rathberger wrote: I assume 4 poles? 6 pole solid frame only. Mike, It's a four pole stator. No difference in appearance from it's 104v 60 cycle counterpart. 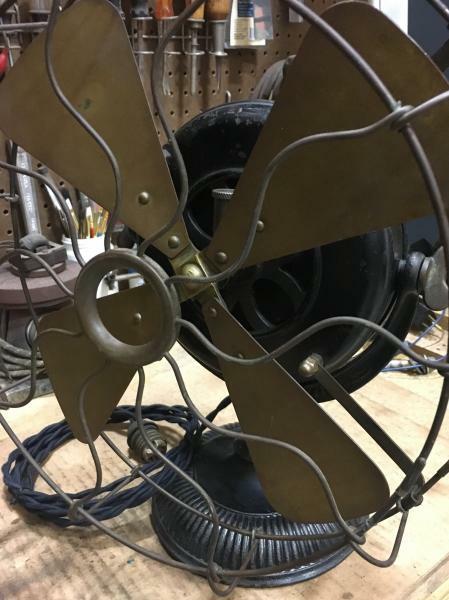 The fan Russ pictured is the 1899 solid frame type UI form F5 six pole stator, single speed. Only year it was offered. Runs at 1100 rpm. Doesn't have a choke coil and the switch was the three position switch used on the E7, F4, and G2 desk models. Instead of Off Hi Low, it is Off Off On. The stator uses 1 inch of laminations. Since the subject of the F5 six pole stator came up, here is a question I have. I'm sure I have brought this up in the past, but still don't have a good explaination for it's existence. 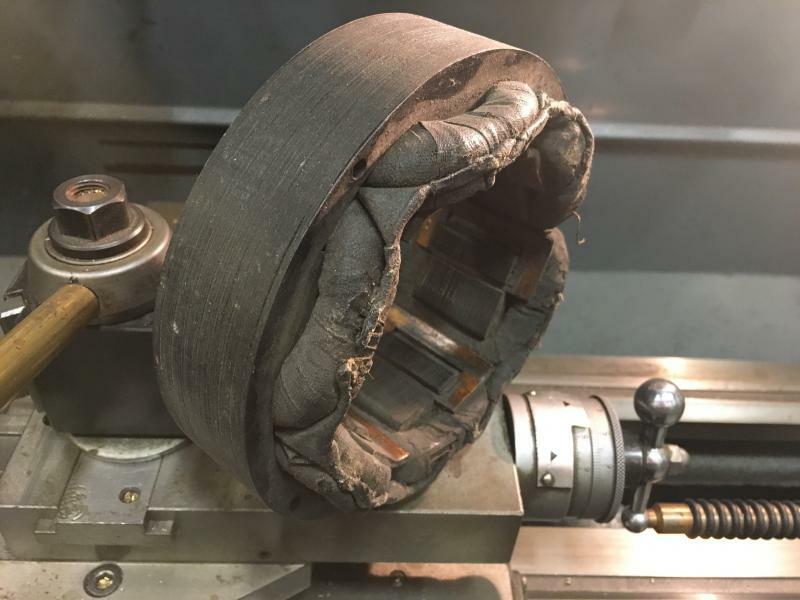 I have a six pole Pancake stator with 1-1/2 inches of laminations. 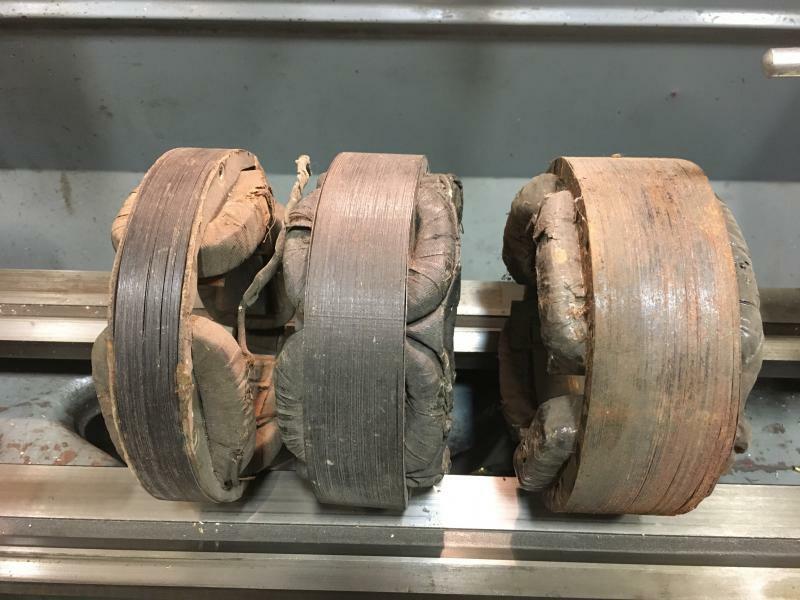 I know the 1-1/2 inch stator made it's appearance in 1895 with the type UI form D 12 inch Lynn Works. It had eight poles and was 125 cycles. In 1896, the 1-1/2" stator came with the type UI form E2 trunnion mount 12" fan. It continued with the '97 and '98 12 inch models both in 60 cycle 4 pole and 125 cycle 8 pole stator. It was also used in the '98 14 inch and continued with these models thru 1901. 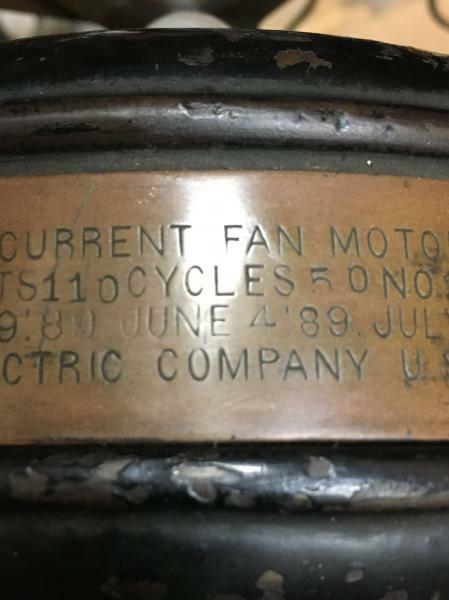 The 16 inch motor made it's appearance in 1899 as a Bracket motor and it's stator used 2 inches of laminations. This continued thru the 1908 desk, bracket, grinder, and sewing machine models. Here's my thought process and perhaps someone can tell me how flawed it is on this subject......1894 model D was a 10" 6 wing fan. It was 125 cycle and had 1 inch of iron. Strong enough to turn the 6 wing fan. Same model 10 inch in 1895, but the 12 inch model D was also introduced. It featured the 6 wing blade and it's motor used 1-1/2 inches of laminations. Still 125 cycles. Strong enough to turn the larger blade. In 1896, the 10" model D was still offered and now was offered in four pole 60 cycles. Still strong enough to turn the 6 wing blade. The 12 inch trunnion model E was introduced and featured a stator with 1" of laminations. Still used the 6 wing blade but was barely on the market before it was replaced with a new motor featuring 1-1/2 inches of laminations. Perhaps it wasn't up to moving the 6 wing blade. In 1897-98, the 10 inch offering was still 6 wing fan and 1 inch stator and the 12 inch offering was 6 wing fan and 1-1/2 inch stator. In '98, 14 inch model G was introduced with 6 wing fan and 1-1/2 inch stator. I guess it was strong enough to model the larger 6 wing fan. Now in 1899, 6 wing fans are discontinued in favor of 4 wing fans. 10 inch fan motors are discontinued. 12 inch fan motors now feature 1 inch stators, 14 inch motor have 1-1/2 inch stators, and the newly introduced 16 inch fan motors use 2 inch stators. James Henderson wrote: Time for Russ. I don't argue with Frank. He has bigger muscles than I do. No arguments on my end. Just trying to figure out what this stator would have been in. I've been thru all of the GE catalogs 1894-1908 and nothing. Was hoping maybe you have seen something in your research of the journals that caught your eye. My thoughts are just guesses...…. There is no argument in your statement but my agreement. 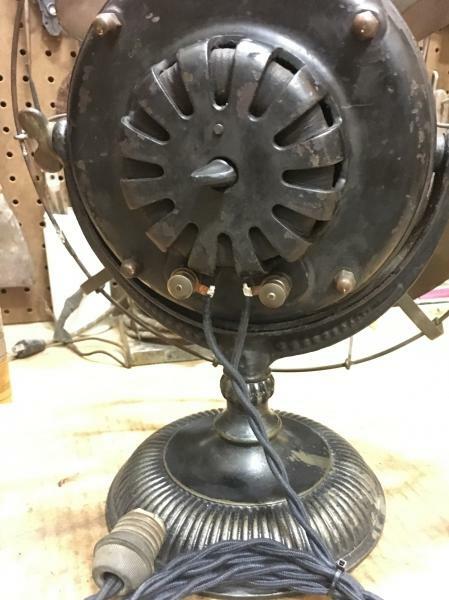 I also want to support you statement- "...1894 model D was a 10" 6 wing fan. It was 125 cycle and had 1 inch of iron. Strong enough to turn the 6 wing fan." and I found out that my 1894 fan does not have bearing of any kind, just bare machined lubricated cast iron shaft hole, so motor has to overcome extra friction, doesn't it? 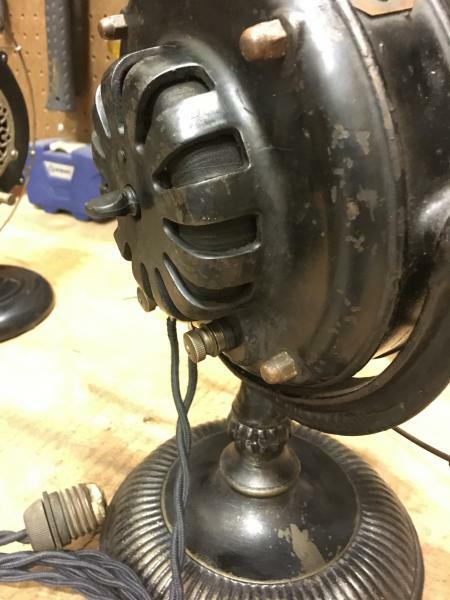 Ted Kaczor wrote: I found out that my 1894 fan does not have bearing of any kind, just bare machined lubricated cast iron shaft hole, so motor has to overcome extra friction, doesn't it? Emerson did it for years. Unless I am missing something the 1/2" bearing shaft is machined hardened steel with lubrication holes drilled into it. 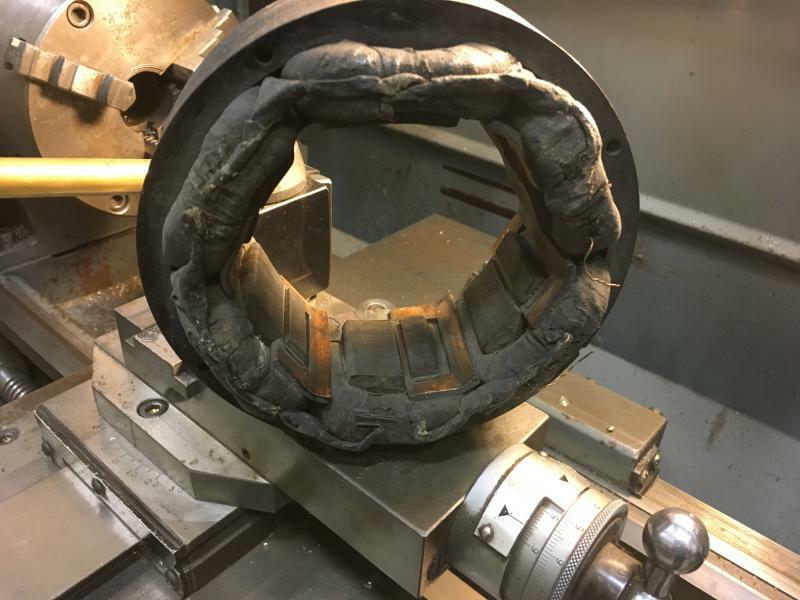 The rotor on the other hand has a smooth surface hole drilled through its cast iron center leaving cast iron bearing surfaces at front and back of the rotor. A. C. Gilbert on the other hand gave it a try with drilling armature shaft holes into the pot metal motor housing. Alfred's mighty mouse fan was designed to run at roughly 3600 RPM. Needless to say Alfred did not have plans for longevity when he pumped those fans out like hot cakes. Fact Jack. Russ, I wonder if the Emerson got the idea from GE? Ted Kaczor wrote: Russ, I wonder if the Emerson got the idea from GE? Robert Lundell (Interior Conduit desk Fan) by 93 had self adjusting brass bearings. It's called way ahead of the pack. The Emerson design in my opinion without prejudice is impressive. There is a distinct possibility Fred Briner was the man/engineer behind the concept for Emerson following Alexander's death in 93. Parker holds the patent, but Parker was the CEO. Edison held a number of patents conceived by another. Page processed in 0.2676 seconds (44% database + 56% PHP). 32 queries executed.